Stylianos Tziritas and Makis Papassimakopoulos gave birth to the band in August 2004. Their influences are summed-up to Curtis Blow, Rick James, Michalis Karanassidis, (the early) John Zorn and the newcomers Are Weapons and Very Very (Very I told U) Unlimited. Tziritas takes part in various projects (Archery Target / Dexamenoplio) and Papassimakopoulos is lead vocalist to the band Stereo Shortcuts, while both were members of the legendary band Kopsokefaloi. They also hold the two 3rds of responsibility for the band Sotto. Trypanosoma appeared for the first time in Deafntinia 2004 festival (September 25, 2004). On December 12, 2004 they were opening act to Lydia Lunch in Athens. In March 16, 2005 they took part in CCR Festival, while they appeared in the second day of the 2nd Synch festival, at “Archeio” stage in July 2, 2005. 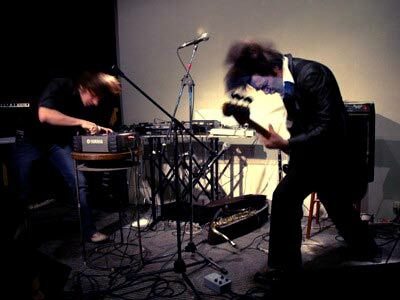 Trypanosoma’s live acts, like the music magazine Difono wrote, are characterized by “artistic hardness”.